Arrange baguette slices on a large baking sheet and drizzle lightly with olive oil. Season with salt and pepper and bake for about 6 minutes, until crisp and golden brown. Heat a 10-inch ovenproof skillet, over medium high heat. Add 2 tablespoons olive oil and the onions, cook until soft. Add the mushrooms and saute until starting to lightly brown, then add the spinach and cook until wilted. Stir in the thyme, 1/4 cup of the broth and the heavy cream. Simmer over moderate high heat until slightly thickened, about 3 minutes. Season with salt and pepper to taste and transfer half of the spinach-mushroom mixture to a plate. Spread the remaining spinach-mushroom mix in an even layer in the skillet. Sprinkle with 2 tablespoons Gruyere, 1 tablespoon Parmigiano-Reggiano and 1/3 goat cheese. Arrange alternatively slices of tomato and baguette to cover. Spread the reserved mushroom-spinach mixture, 2 tablespoon Gruyere, 1 tablespoon Parmigiano-Reggiano and 1/3 goat cheese over the baguette-tomato layer. Arrange remaining baguette and tomato slices as before, top with remaining Gruyere, Parmigiano-Reggiano and goat cheese. Drizzle with olive oil and season with salt and pepper. Carefully pour 1/4 cup of broth around the edges and over top. Bake until the top is golden brown and the tomatoes have released their juices, about 35 minutes. Let stand for 10 minutes before serving. The strata can be made in a similar sized casserole dish. 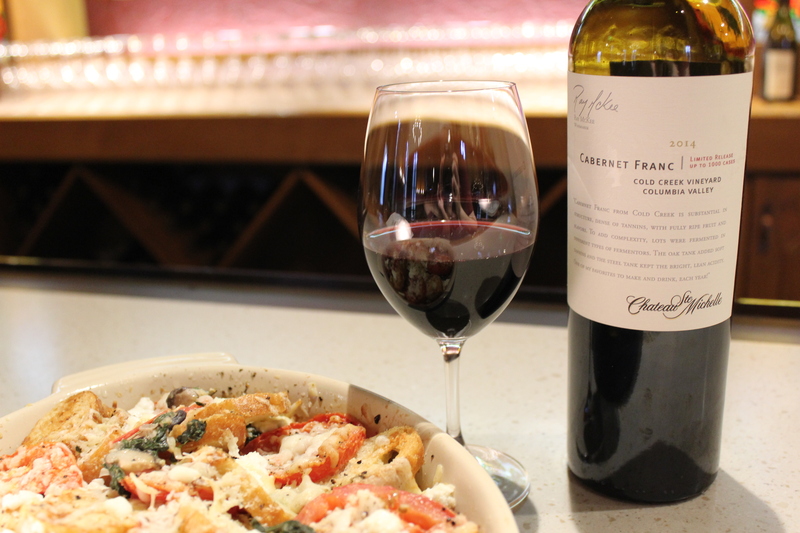 Serve with a wonderful bottle of Chateau Ste Michelle 2014 Cabernet Franc.